Developing yoga with horses was really hard for me at first. 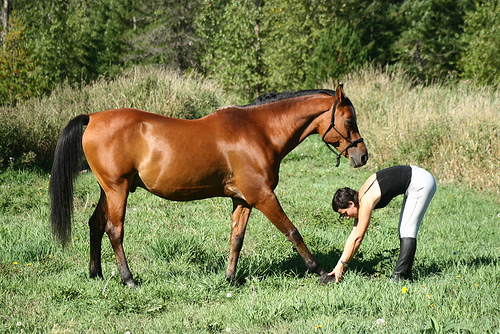 Like I said, yoga with horses was something I created from necessity, not something that was put together intentionally. I had many different opinions about what I wanted it to become. I finally decided that a set routine was the best idea. I had been doing Bikram yoga for years. Bikram yoga is a series of 27 poses done in a heated room. It’s the same 27 postures every time. It may seem surprising but it never ever felt like the same class. I bet anyone who does it will attest to this. Each time you do the class your body and mind are in a different place and thus your class always has different challenges and successes. I felt that this would be the same. Especially because in this case, it’s not just your body and mind but your horses as well. Now you might be thinking the same thing I was at this point. How can I possible have time to stretch myself, stretch my horse and groom and ride and do barn chores and…? Some details started to get left out…but some started to combine!